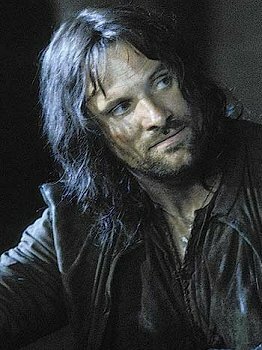 Following the conclusion of FotR, Aragorn, Legolas and Gimli follow the trail of the Uruk-hai's and Orcs that have taken Merry and Pippin hostage. 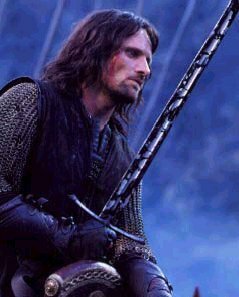 They follow the Orcs from the River Anduin to the kingdom of Rohan where they meet Éomer and his riders. 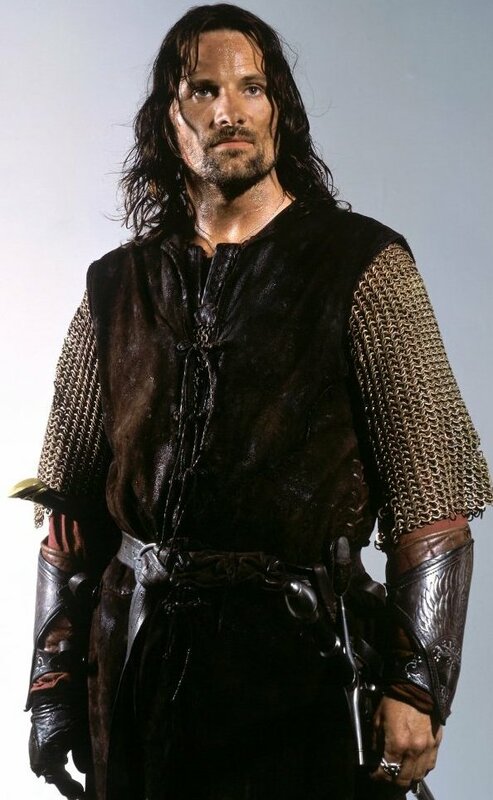 After convincing Éomer that they are not Saruman's spies they are given horses and the news that the band of Uruk-hai's they were tracking were all killed and burnt. 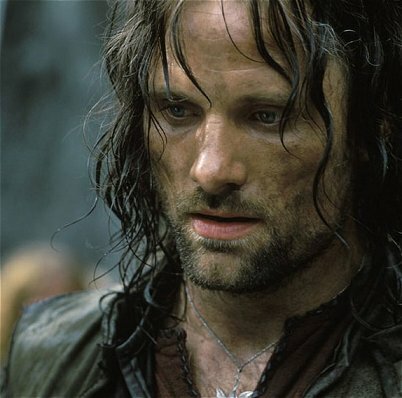 After running through the remains of the Orcs, Aragorn screams in frustration and discovers that the two Hobbits had in fact escaped the carnage and went into the dark and dreary Fangorn forest. The trio follow the hobbits trail until it unexpectedly disappears leaving only strange tracks behind, then to their surprise they encounter the White Wizard - Gandalf the White and travel to Edoras. 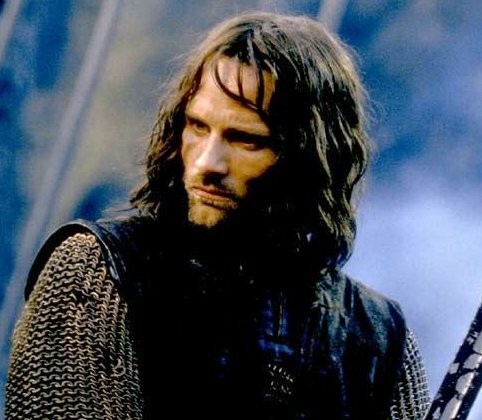 At Edoras Aragorn quickly advises the King Théoden that war is eminent and that they must fight, Théoden evacuates the city to the fortress of Helm's Deep. 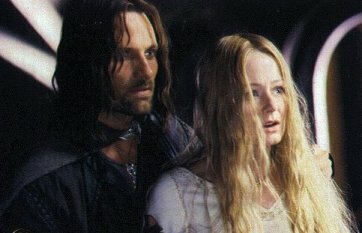 But along the way, as Aragorn contemplates the leaving of Arwen and the growing affection for Théoden's niece, Éowyn, a group of Warg riders attack the group and Aragorn is thrown over a cliff into the river below. 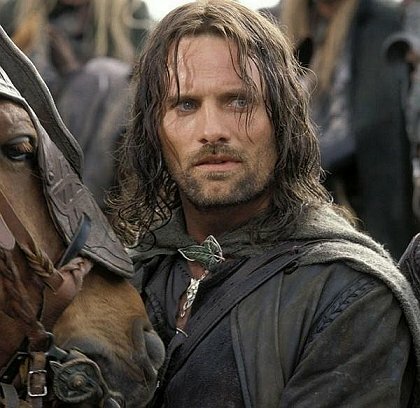 There he drifts till he is rescued by a brown horse (see picture below) who's name is Brego - who was once the horse of King Théoden's son, Théodred. 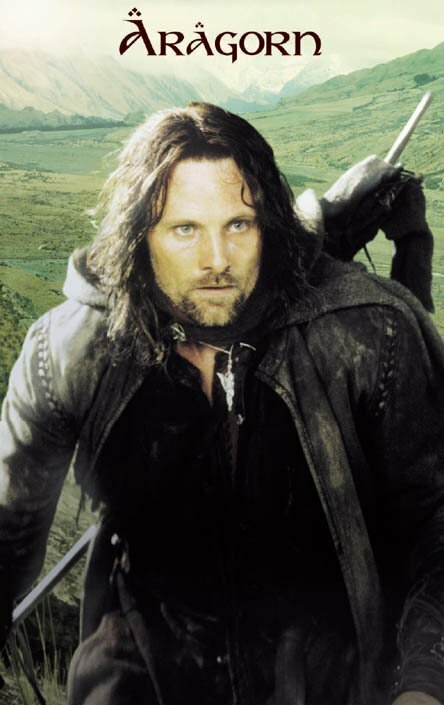 Brego carries Aragorn to Helm's Deep where he sees Saruman's Orcs amassing and carries word of their eminent arrival. 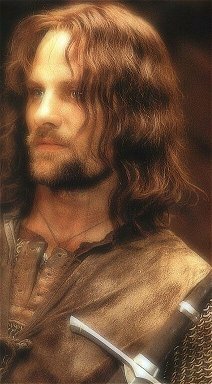 Upon arriving at Helm's Deep he is affectionately greeted by Gimli with a hug and with a "You're late....You look terrible" from Legolas. 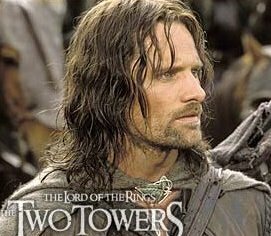 He argues with Legolas over the futileness of the fight andvows "And I will die with them" though only hours before the Orcs arrive a loud non Orcish horn is heard from outside the gates - Haldir and his elves have arrived. 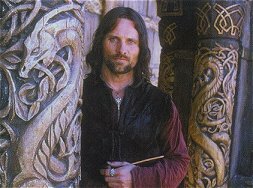 Both Aragorn and Legolas rush down to the gates to greet the Elf Captain - Aragorn giving him an affectionate (and surprising) hug. 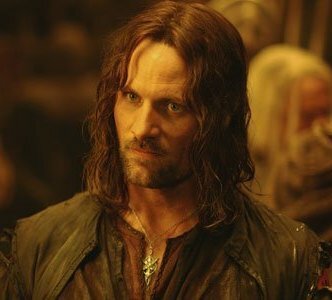 Aragorn, along with Haldir lead the elves in the battle for Helm's Deep. 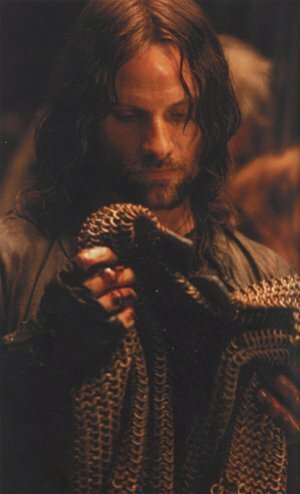 As the fight becomes more and more futile Aragorn retreats his men to the fortress of Helm's Deep and calls out to Haldir to retreat the rest of the men - only to find that the Elf Captain, very sadly, has been wounded - rushing up to the battlement he catches the falling Haldir - only to find him dead in his arms (sooooo sad). 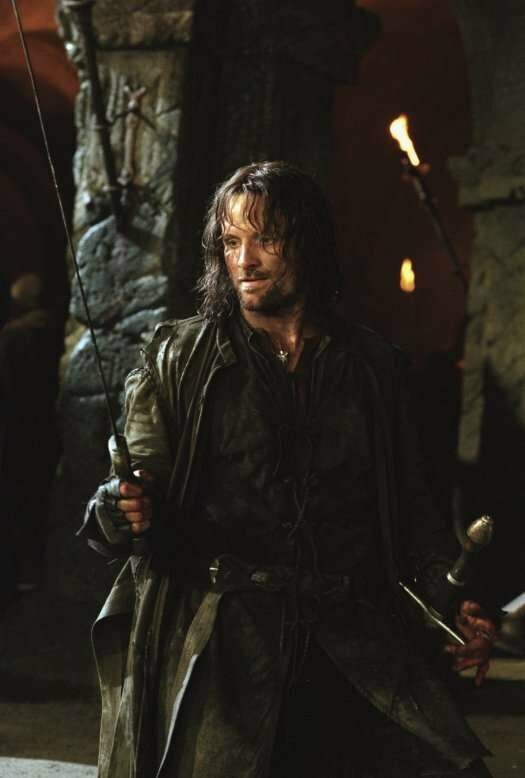 The men and women of Helm's Deep retreat to the Glittering Caves, where Aragorn convinces Théoden to ride out and meet the Orc army head on - where once they reach the outside they find that Gandalf has returned with Éomer and his men to "save the day." And so the story will continue next December so for now I have these pictures to tide you over. 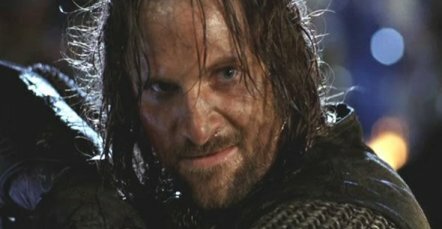 Personally I love all of the emotion Aragorn shows in this "installment" he is funny: "It's the beards," angry, frustrated, glad and the affection he shows for all of the characters - especially Legolas and Gimli is brilliant. I personally love the bit where he hugs Haldir - that just made me laugh (see Haldir's Secret Diary for my account of this event).